I don't know about you, but I grew up with a strong dislike for my name (my first name to some extent, but ESPECIALLY my last - and those of you know the last name I was born with no doubt can understand why). My first name grew on me (and I got to exchange my surname when I met my wonderful husband), but I think this is something that almost every child goes through. For that reason, and several others, I have chosen this fun, silly, delightful book for my contribution to the lovely Susanna Leonard Hill's Perfect Picture Book Friday. I've known you since you were a baby. In the shade or the sun. You're my best friend for sure, not maybe." "Thank you, Sidney!" said Gabie, pleased that the forgetful Sidney had remember his birthday. "You have such a way with words." Sidney grinned. He thought he had a way with words too. But he thought it might be showing off to say so. Resources: Have the kids try to figure out words that rhyme with their own name - you can use Rhymezone, or a rhyming dictionary, to help. Have the kids find out why their parents picked their name and why it is special to them. If they could change their name, would they? What does their name mean? Most baby name websites have this information. Why I LOVE it: For one, I can totally relate (and I think a lot of other folks can too). 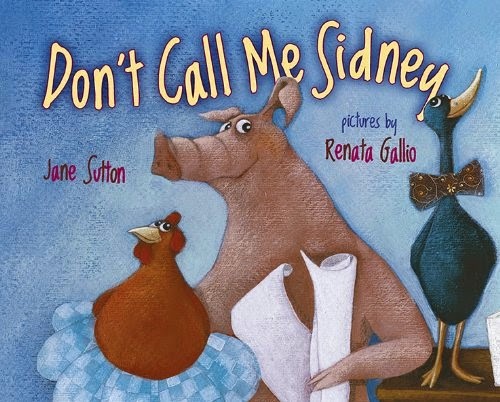 I also love the voice/tone, the humor, and the relationships Sidney has with Gabie - and his mother. Some of the jokes are funny even the 10th time around (to me, anyway - disclaimer: my hubby thought this one was kind of stupid). A fun book all around. Oh, you've piqued my curiosity with this one. I do a nickname lesson and it sounds like this one would be a perfect match! I love humor and voice in a book, for sure. Thank you for scouting Kidney ... er, Sydney ... out for us. I do hope you pick it up, Barbara. I think it would go VERY well with a nickname lesson - especially because of the second-to-last page - which I will NOT give away here LOL. Thanks for stopping by! This is so wonderfully how a kid would respond to this situation. And a great text with which to do a rhyming lesson. Exactly, Joanna! Loved this one for SO many reasons. Thanks for coming by! Great fun! Sadly, I gave my eldest a name that rhymes with far worse. Thank goodness no one at school has poked fun at him yet. He might enjoy this book. Praying your son NEVER gets poked fun at (but I'm not betting the farm LOL). I am sure he WILL enjoy it. Thanks for stopping by! I would laugh too - even more :). Thanks for stopping by - hope you pick it up! Great book to help kids understanding giving from the heart. It's also has humor. I also like that it teaches kids to think about rhyming with such simple things as their names. Love this choice. I love the idea of asking kids what name they would like, if they could pick it and why. I always wanted a nickname. Never happened. Wendy, I have a friend who got her first nickname in her 60s. It's not too late LOL (and I've got my thinking cap on!). Thanks for stopping by! I can totally relate to this story. I haven't always liked my name either. I also used to have a nickname my dad used. lol. Hope you pick it up, Diane - I think you'd love it. Thanks for stopping by! This sounds like a barrel of laughs! Thanks, Joanne. I've seen this one (and met the author!) and it's so much fun! Good pick! Sure is - thanks for stopping by, Stacy! Bwahahaha! Sounds like a really cute book. On my to read list now. Hope you love it as much as I did (or more LOL). Thanks for stopping by, Keila! Thank, Linda :) Glad you stopped by - got any grandkids to share this one with yet? ?